The Texas Rangers visit Safeco Field on Tuesday, September 19, 2017 to play the Seattle Mariners. The probable starters are Martin Perez for the Rangers and Mike Leake for the Mariners. The opening line for this matchup has Texas at +155 and Seattle at -165. The Rangers have a 68-75-6 over/under record and a 82-67-0 run line mark. The Mariners are 66-84-0 against the run line and have a 71-74-5 over/under record. The Rangers have a 73-76 overall record this season. Starting pitcher Martin Perez has a 12-11 record with an earned run average of 4.82 and a WHIP of 1.56. He has 107 strikeouts over his 168 innings pitched and he's given up 206 hits. He allows 11 hits per 9 innings and he has a FIP of 4.62. The bullpen has an earned run average of 4.66 and they have given up 486 base hits on the year. Teams are hitting .262 against the bullpen and they've struck out 430 hitters and walked 215 batters. As a team, Texas allows 9 hits per nine innings while striking out 7 batters per nine innings. They are 18th in the league in team earned run average at 4.6. The Rangers pitchers collectively have given up 1,320 base hits and 675 earned runs. They have allowed 196 home runs this season, ranking them 11th in the league. Texas as a pitching staff has walked 523 batters and struck out 1,022. They have walked 3.6 men per 9 innings while striking out 7 per 9. They have a team WHIP of 1.40 and their FIP as a unit is 4.87. As a team Texas is hitting .246, good for 24th in the league. The Rangers hold a .437 team slugging percentage and an on-base percentage of .324, which is good for 17th in baseball. They rank 26th in MLB with 8.2 hits per game. Nomar Mazara is hitting .255 with an on-base percentage of .330. He has 129 hits this season in 506 at bats with 94 runs batted in. He has a slugging percentage of .433 and an OPS+ of 97. Elvis Andrus is hitting .301 this year and he has an on-base percentage of .343. He has totaled 178 hits and he has driven in 85 men in 592 at bats. His OPS+ is 113 while his slugging percentage is at .486. The Rangers have 1,229 hits, including 241 doubles and 224 home runs. Texas has walked 514 times so far this season and they have struck out 1,364 times as a unit. They have left 934 men on base and have a team OPS of .760. They score 5.09 runs per contest and have scored a total of 759 runs this year. Seattle has a 74-76 overall mark this year. With an earned run average of 4.01, Mike Leake has a 10-12 record and a 1.30 WHIP. He has 120 strikeouts over the 172.2 innings he's pitched. He's also given up 188 hits. He allows 9.8 hits per nine innings and his FIP stands at 3.98. The bullpen has an earned run average of 3.98 and they have given up 481 base hits on the year. Teams are hitting .238 against the Mariners bullpen. Their relievers have struck out 495 batters and walked 201 opposing hitters. As a team, Seattle allows 8.8 hits per nine innings while striking out 7.7 batters per nine innings. They are 15th in the league in team earned run average at 4.46. The Mariners pitchers as a team have surrendered 1,299 base knocks and 662 earned runs this season. They have given up 220 home runs this year, which ranks 4th in Major League Baseball. Seattle as a staff has walked 468 hitters and struck out 1,135 batters. They give up a walk 3.2 times per 9 innings while they strike out 7.7 per 9. Their team WHIP is 1.32 while their FIP as a staff is 4.76. As a team, they are batting .259, good for 14th in the league. The Mariners hold a .421 team slugging percentage and an on-base percentage of .326, which is good for 15th in baseball. They rank 11th in MLB with 8.9 hits per contest. Robinson Cano comes into this matchup batting .283 with an OBP of .342. He has 154 hits this year along with 90 RBI in 544 AB's. He maintains a slugging percentage of .460 with an OPS+ of 114. Nelson Cruz is hitting .287 this season and he has an OBP of .373. He has collected 147 hits in 512 at bats while driving in 110 runs. He has an OPS+ of 141 and a slugging percentage of .533. The Mariners as a unit have 1,335 base hits, including 264 doubles and 178 homers. Seattle has walked 452 times this year and they have struck out on 1,179 occasions. They have had 1,012 men left on base and have an OPS of .747. They have scored 4.67 runs per game and totaled 701 runs this season. 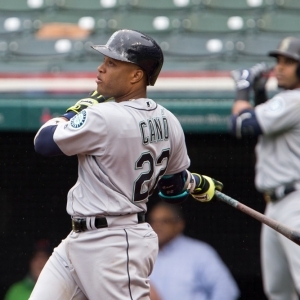 Who will win tonight's Rangers/Mariners MLB game against the spread?